You’d be forgiven for thinking that by the time of George’s eighth solo album, he was bereft of ideas. This 1979 effort finds him not only running out of ideas for album titles, but he also re-uses earlier material: the second-track, Not Guilty, is a leftover from the last self-titled album he was involved in, the Beatles’ eponymous 1968 release. But there’s lots to like about this record. It’s a bit happier and a bit more laid-back than his previous work, having married Olivia Arias and become a father to Dhani a year earlier. Side-two opener Faster – “inspired by Jackie Stewart and Niki Lauda” – is perhaps one of the last hidden gems of George’s solo career – a non-charting single, released as a picture-disc (a first for a Beatle past or present) with all proceeds going to charity (a cancer fund set up following the death of Swedish F1 driver Gunnar Nilsson in 1978). George must have had enough invested into the song to go to the trouble of filming a promotional video for it. Speaking of chart positions, this album comes a full five years after George had a #1 single anywhere in the world – 1973’s Give Me Love (Give Me Peace On Earth), the sole single from Living In The Material World, which topped the US Billboard. His poor chart performance through 1977 and 1978 correlates with the rise of punk, and his more mature songwriting was probably at odds with Johnny Rotten, Joe Strummer and the rest of the new breed of youth music. Here Comes The Moon is lovely, the first single Blow Away is great, and there really isn’t a weak song on the album. But that’s probably the rub – while George might not write or record bad songs by this point, he also doesn’t write or record anything particularly outstanding. His next single, All Those Years Ago in 1981 performed much stronger in the wake of John Lennon’s death, and it wouldn’t be until 1987 before he topped the charts again (with his Jeff Lynne-produced cover of I’ve Got My Mind Set On You). Mention must be made of George’s hairstyle during 1979. The rear cover image shows him walking across his garden, not only in the largest pair of flares this side of the 1960s, but with a perm long enough to make any poodle-breeder proud. This entry was posted in 1979, George Harrison, Vinyl Records and tagged 1979, George Harrison, Jeff Lynne, John Lennon, Living In The Material World, The Beatles, The White Album, vinyl on December 11, 2018 by mrjohnnyandrews. You can hear the differences straight away. Paul’s snare beat on Back In The U.S.S.R. is punchier and his vocal ad-libs in the fade-out are much clearer. Then John’s acoustic guitar fades into Dear Prudence and Paul’s pulsing bass sounds on top of everything, front and centre. Released yesterday to celebrate the record’s fifty-year anniversary, Giles Martin’s new 2018 stereo remix of the Beatles’ ‘self-titled’ White Album is an early Christmas present for fans of the band. Repeating the successful formula employed on last year’s stereo remix of Sgt. Pepper’s, Martin Jr. has broken down the White Album recordings, and built them back up again. Untrained ears might not be able to tell the difference, we’re talking subtle changes. Clarity and focus are the operative words, not revisionism. The sliding, uptempo bass line in Ob-La-Di, Ob-La-Da transforms one of my least favourite Beatle songs into a stormer. Eric Clapton’s swirling guitar lines in George’s While My Guitar Gently Weeps feel even more hypnotic. Paul’s bassline in Why Don’t We Do It In The Road sounds funkier. Birthday sounds as insane as the band probably intended it to. Paul’s screaming salvo into Helter Skelter sounds at war with Ringo’s drums. The horns in Savoy Truffle are sharper, the electronic piano line closer to the front of the mix. The 2014 mono remaster was previously my favourite version of this album. I didn’t think anything could beat that. How wrong I was. All in all, this new release is like listening to the album for the first time, with fresh ears. And if that wasn’t enough, the other half of the box-set is just as revelatory. In May 1968, fresh from their Rishikesh trip, the Beatles convened at Kinfauns, George’s house in Esher, Surrey. There, they recorded demo versions of 26 of the White Albums’s 40 tracks, plus songs that didn’t make the intended album. Glimpsed on 1997’s Anthology 3, Giles Martin has now remixed these tapes and re-sequenced them into a double-LP with – where possible – the same running order as the 1968 album. Hearing McCartney doing a loosely double-tracked Back In The U.S.S.R. on an acoustic guitar – complete with a sung guitar solo – is just fantastic, and really fills me with hope that there’s more material like this yet to see an official release. The songs that were worked out in the White Album studio sessions – Wild Honey Pie, Martha My Dear, Don’t Pass Me By, Why Don’t We Do It In The Road, I Will, Birthday, Helter Skelter, Long, Long, Long, Savoy Truffle, Revolution 9 and Good Night – don’t appear here in demo form. Instead we get a raft of songs intended for the album, but which appeared elsewhere: George’s Sour Milk Sea (a single for Jackie Lomax), Not Guilty (re-recorded for his 1979 record, George Harrison), and Circles (re-recorded for 1982’s Gone Troppo), Paul’s Junk (soon to be heard on 1970’s McCartney), and John’s Child Of Nature (reworked as Jealous Guy from 1971’s Imagine). Two other Lennon demos presented here – Mean Mr. Mustard and Polythene Pam would be reworked into the medley on Abbey Road in 1969. The demos make for a fantastic listen. Complete with between-take chatter, coughs and sniffs, the sound quality is mostly very good with the occasional bit of tape-hiss evident on some tracks. In hindsight, the Beatles probably didn’t need to go to Abbey Road and Trident to re-record these demos – they could have just released this back in 1968. While it now seems inevitable that Giles Martin will provide similar remix duties for next year’s half-century release of Abbey Road, followed by Let It Be in 2020, I really hope he continues with the pre-Pepper albums as they begin their sixty-year celebrations from 2023. This entry was posted in 1968, The Beatles, Vinyl Records and tagged 1968, 2018, Abbey Road, Abbey Road Studios, Anthology 3, Apple Records, Esher Demos, George Harrison, Giles Martin, Gone Troppo, Imagine, Jackie Lomax, John Lennon, Let It Be, McCartney, Paul McCartney, Ringo Starr, Sgt. Pepper's Lonely Hearts Club Band, The Beatles, The White Album, Trident Studios on November 10, 2018 by mrjohnnyandrews. So the plan was to buy the Beatles In Mono vinyl box set, and then sell the stereo box set that I bought a couple of years ago. That was the plan. But then I got it home – from supporting my local independent record store, I like to add – and plonked it down on my shelves next to the stereo set. I couldn’t split these two up, could I? Not when they’re both so…different. The differences – both minor and major – are a wonderful thing between these two sets. 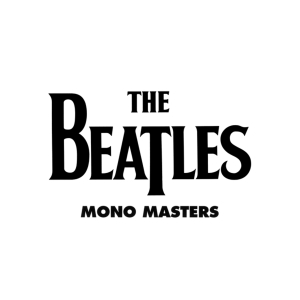 I do agree that mono is king, especially here when the Beatles contributed to the mono mixes, and left the ‘after the fact’ stereo mixes to the studio engineers. It’s just such an oddity how some of the changes can be so noticeable. For a band known for their high quality control, it’s amazing that the stereo mixes were handled so poorly. People applaud George Martin and the Beatles for being so innovative and forward-thinking. Here, they were largely disregarding an audio format that would go on to dominate the music industry by the end of the decade. It’s nice to see that they expanded this record into a triple, rather than reduce the running time due to some of the later singles not receiving a mono mix. In place of those later singles, we get some tracks mixed in mono intended for a Yellow Submarine EP that never saw the light of day. As welcome as this is, it does change things slightly – in the past I always say the two Past Masters discs as representative of each half of their career. Past Masters Vol. 2 begins with Day Tripper, recorded during the Rubber Soul sessions just as the Beatles were starting to wholeheartedly reflect outside influences, in this case the Motown sound. On Mono Masters, Day Tripper turns up halfway through the third side. With the Beatles In Mono box set, I now own the core catalogue three times over (I already owned them all prior to the stereo remasters). Do I need three copies of the White Album? Three copies of Revolver and Rubber Soul? Three copies of Sgt. Pepper’s? Damn right I do! This entry was posted in 2009, The Beatles and tagged 2009, George Martin, Mono Masters, Past Masters, Past Masters Vol. 1, Past Masters Vol.2, Revolver, Rubber Soul, Sgt. Pepper's Lonely Hearts Club Band, The Beatles, The White Album, vinyl, Yellow Submarine on April 17, 2015 by mrjohnnyandrews. The lines have since been blurred by subsequent compilation albums, but the Red and Blue Albums used to serve as an excellent line in the sand. Did you prefer the moptop Beatlemania of the Red Album, or the maturing experimentation of the Blue Album? The turning point chosen was the Blue Album’s opener, John Lennon’s Strawberry Fields Forever­ – a key moment of evolution in studio production, and a chance for the Fab Four to try out their new moustaches. The Blue Album is definitely a more balanced offering than its counterpart. Whereas Allen Klein topped up the Red Album’s shorter running time by including many songs from Rubber Soul (presumably his favourite album), here the tracks are more evenly spread out: four album tracks from Sgt. Peppers, three from the Magical Mystery Tour soundtrack, three from the White Album, four from Abbey Road, three from Let It Be, and the rest of the songs coming from singles and b-sides. 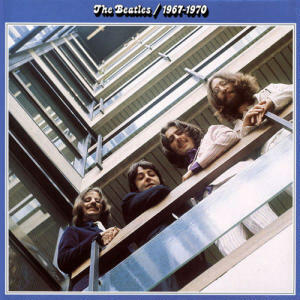 If anything you could say that the White Album is the least represented – a sprawling double-album with only three songs present – but given that this compilation collects all of their lengthier late-period songs, I guess some allowances had to be made to be able to make it a double-album, symmetrical to the Red Album. These four years could easily have been extended into a triple-album, but maybe Klein figured that a triple-album wouldn’t have had any more pulling power than a double. I do question the inclusion of George Harrison’s Old Brown Shoe – the b-side to The Ballad Of John And Yoko. There are definitely stronger album tracks from around that period, which I would probably have substituted in its place – but I welcome its obscurity, a song that would later see the light of day on Past Masters Vol. 2, but at the time a definite hidden gem in their back-catalogue. While I see the point of the 1 compilation – 2000’s attempt at putting all of the band’s number one singles in one collection – the Red and Blue Albums have the luxury of including album tracks. On 1, the years between 1967 and 1970 are represented by just eleven songs, while the Blue Album manages to cover the same period with twenty eight tracks (and doesn’t ever seem overlong or outstay its welcome). For me, the only real sour note on this compilation is the inclusion of Ob-La-Di, Ob-La-Da – one of my least favourite Beatles songs. It’s definitely the catchiest track from the White Album, and probably only included here as it was such a hit single for Marmalade in January 1969 – with this single they achieved the notoriety of being the first ever Scottish band to hit number one in the UK singles chart. This entry was posted in 1973, The Beatles and tagged 1962-1966, 1967-1970, 1973, Abbey Road, Allen Klein, George Harrison, John Lennon, Let It Be, Magical Mystery Tour, Past Masters Vol.2, Rubber Soul, Sgt. Pepper's Lonely Hearts Club Band, The Beatles, The Blue Album, The Red Album, The White Album, vinyl on October 1, 2013 by mrjohnnyandrews. I’m with Moo on this one – mono is pretty pointless. It makes sense if the artist originally mixed it in mono, and intended its release in mono, but most of the time it’s a marketing ploy aimed at audiophiles. Take this release for example – the limited edition release of McCartney’s second solo album in mono, complete with the most minimal sleeve I’ve ever seen (aside from the scrawl on the top left of the sleeve, the only mention of the album name and artist is on a small slip of paper inside the inner sleeve – it makes the packaging of The White Album look like Sgt. Pepper’s). There’s no reason for it to exist. Mono had been left behind by this point, and all releases were universally in stereo. It exists merely as a curiosity. However, it’s by a Beatle, it’s a limited collection, and therefore it’s collectable – hence why I bought it. I have the stereo version, with its garish sleeve (possibly the reason this mono release is so minimalist?) and it’s always been a firm favourite. In fact, I swapped my CD copy of the album for the vinyl version back in the late 90s. My Huddersfield friend Dom Beresford had it on vinyl and wanted it on CD. I felt the opposite, so we did a fair trade. The record is forever marked by this transaction – a sticker on the label around the centre of the disc proudly declares it is the property of Kirklees Libraries & Arts. There’s been a hell of a lot of love for this album of late. It is very good – about a million times better than his hotchpotch debut album; but as much as I love it, and regard it as my favourite McCartney album, it’s not as good as Band On The Run. I don’t subscribe to the theory that his Wings material is more of a group offering – to me, they’re McCartney albums with a couple of hired hands to play some of the instruments so he didn’t have to play everything. In terms of the quality of the songwriting here, he matches the strength of his output on Abbey Road. The melodies are strong enough to support an orchestral version of the album – something I’ve been listening to a lot recently. 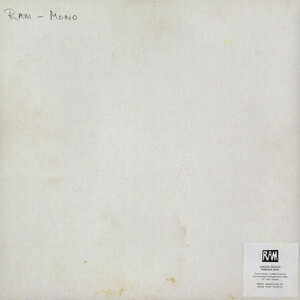 To me, Ram is as strong an album as Imagine – in fact they’d make a killer double album – but it’ll never be as loved by the public as Lennon’s album. There are no big hits, and definitely nothing close to the universality of Imagine’s titular track. This entry was posted in 1971, John Lennon, Paul McCartney, The Beatles, Wings and tagged Band On The Run, Dominic Beresford, McCartney, mono, Moo Gibson, Ram, Sgt. Pepper's Lonely Hearts Club Band, The White Album, vinyl on August 12, 2012 by mrjohnnyandrews. It’s odd that they released this, as though admitting that the original Yellow Submarine soundtrack released in 1968 was a bit of a mistake. That album has four previously unreleased songs of varying quality on one side, bookended by the title song and All You Need Is Love; with the flipside covering George Martin’s orchestral score for the film. 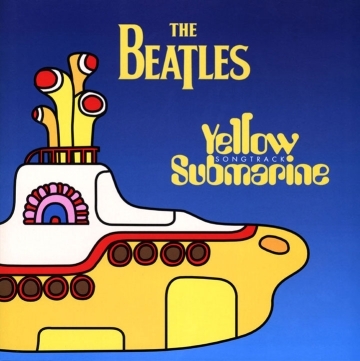 Of the studio albums in their official cannon, this has to be the weakest as half of it isn’t them playing, and the rest is half-hearted, at best.Released in 1999 to promote the re-release of the animated film, the Yellow Submarine Songtrack tries to wrong those rights by removing the George Martin tracks and filling the album out with the other Beatles songs that appear in the movie. Hey Bulldog takes pride of place as the first song on the album (after the title song), and this was released as the only single from the album. Of those 4 previously unreleased songs that appeared on the original soundtrack, it’s clearly the best one – a nice little riff-driven rocker by Lennon that wouldn’t have been out of place as a B-side around the time of The White Album when it was recorded. This is a nice addition to my Beatles collection – the tracks are fully remixed from the original multitrack tapes (something that they didn’t even do for the 2009 remasters), making it a pretty unique release. And of course it’s on yellow vinyl, and who doesn’t like coloured vinyl? This entry was posted in 1968, 1999, George Harrison, John Lennon, Paul McCartney, Ringo Starr, The Beatles and tagged coloured vinyl, Hey Bulldog, The White Album, Yellow Submarine, Yellow Submarine Songtrack on May 27, 2012 by mrjohnnyandrews. Here, you’ll find Rocks In The Attic – a disc by disc journey through my vinyl collection, without the musty smell that accompanies it in person. Also featured are Rocks In The Attic’s Buyer’s Guides, which take an in-depth look at a specific artist’s back catalogue. Take a look, and please leave a comment if you have something to say.